In the dead of a Midwest winter, sunlight can seem scarce. But the future of the solar energy industry here looks a little brighter, thanks to recently announced plans to cut red tape for residential and commercial building owners who want to install rooftop solar panels. 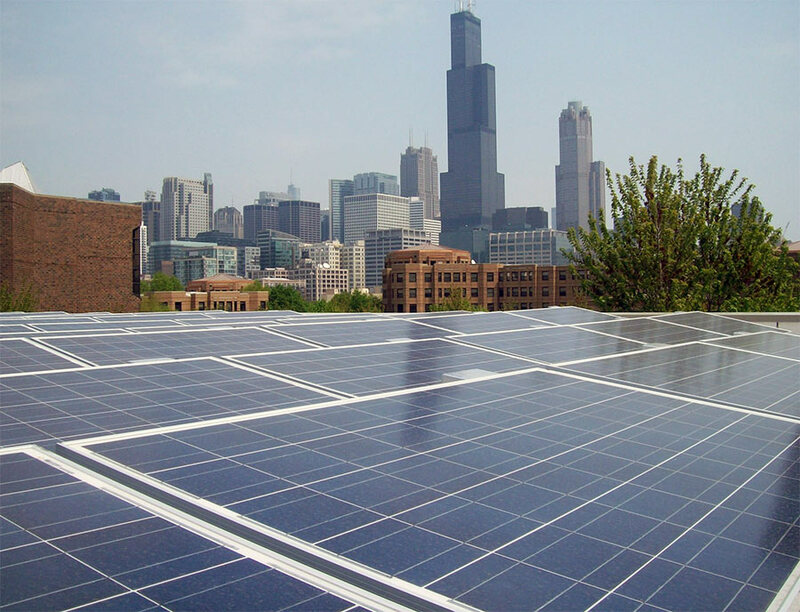 In October, Mayor Rahm Emanuel unveiled Chicago Solar Express, a “one-stop shop” for getting rooftop solar permitted, installed, and connected. Instead of 30 days, city approval for such projects now takes only one day. Meanwhile a $750,000 “SunShot” grant from the Department of Energy will help cut the price of that permit by 25 percent, to $275. The SunShot Rooftop Solar Challenge is a national initiative to make solar power cost competitive with other sources of energy by 2020. The move is well timed. A tax break for projects with renewable energy is set to fall from 30 percent to 10 percent at the end of 2016. Eligible projects have to be up and running by that date, so there will be a rush to get them online. Federal incentives are still crucial for the U.S. renewable energy industry, which has seen explosive growth in recent years. In 2011, when Congress seemed ready to cut the production tax credit for wind farms, experts warned the business could grind to a halt. The credit was renewed as part of an 11th-hour budget agreement, and 2012 was a banner year for wind energy. Critics argue renewable energy’s reliance on government incentives and grants is evidence that the industry is a losing bet. But those who want to see the programs continued point out fossil fuel companies benefit from subsidies, too—many set up during the 20th century and taken for granted today. 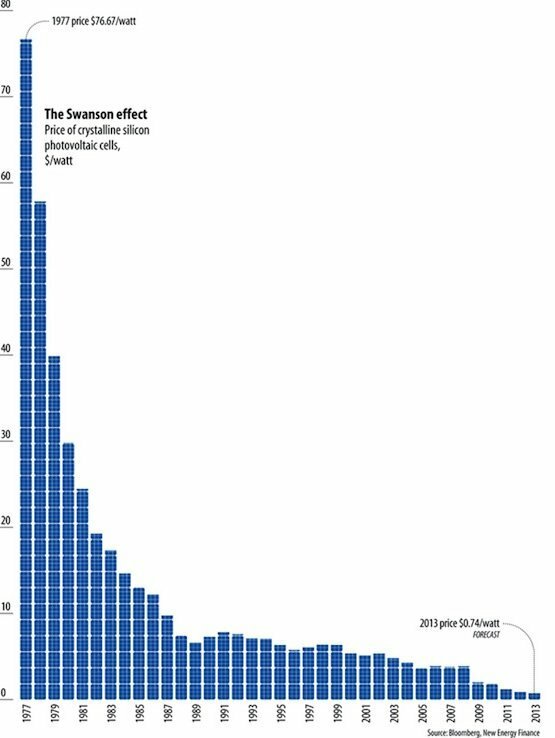 At any rate, a solar building boom should make solar cheaper, which could help make such subsidies unnecessary. The price of crystalline silicon photovoltaic cells today is 74 cents per watt according to Bloomberg, less than 1 percent of what they cost in 1977. And Chicago’s push to make it faster and cheaper for building owners to add solar power is not the only development. ComEd said it would launch its Online Interconnection and Metering Enrollment program by the end of the year. The policy is aimed at connecting distributed solar to an online platform, so solar panel owners can be paid (through credits on their electricity bill) for the power they put back on the grid. (The company launched a pilot program to spur rooftop solar and smart metering in 2010.) Other companies, like NRG Energy-backed Geostellar, are working to streamline the process of matching solar panel customers with installers and financiers. Small-scale, distributed power generation is a good thing not just for ratepayers who could see lower bills as a result, but for the nation at large, whose carbon footprint is slowly shrinking in part as a result of growing renewable energy generation. But challenges persist. A Toledo Blade investigation of that city’s push to become a leader in solar panel manufacturing found the state has struggled to create the jobs that it promised would help reinvent Ohio’s industrial base. Squandered loans, litigation, and taxpayer frustration snarled an effort to compete with Chinese manufacturers. Common knowledge holds that low labor costs make China a leader in the field, but analysts from the National Renewable Energy Laboratory and Massachusetts Institute of Technology (MIT) said it has more to do with the scale of manufacturing there, and with China’s “less restrictive business and regulatory environment.” Supply-chain advantages give China-based manufacturers access to cheaper capital, materials, and machinery than their U.S. counterparts can get. One lesson seems to be if the rust belt wants to resurrect its industrial base with clean technology it is going to need a technological advantage that can make better solar cells for less. But there is plenty of room for growth. A recent study found the grid operator in charge of the eastern Great Lakes and mid-Atlantic region could handle as much as 30 percent renewable energy without threatening electricity delivery—much more than previously assumed. But it needs an overhaul of its transmission infrastructure to do so. There’s an opportunity to energize the rapid growth of renewable energy generation in the Midwest even further: when done well, subsidies can speed up technology price reductions, leaving more money on the table for infrastructure investments that enable technological innovation and expand the market for new renewable energy products. No one knows when solar energy will be cost-competitive with fossil fuels, but smart cities need to be ready when it is.